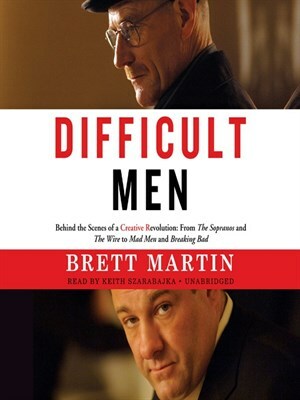 Brett Martin’s book Difficult Men, is a writer’s dream, in that it finally gives credit where credit is due. It doesn’t give undue credit where so many other, lesser periodicals, give credit, to the stars. It doesn’t give undue credit to the directors of the individual episodes, the “brave” networks that eventually broadcast them, or that individual studio exec that provided the show its green light. It does give credit, finally, to those that rarely receive the amount of credit they are due in the court of public opinion, the writer. Martin is more specific in his dispersal of credit when he says it’s not just any writer that deserves credit for the success of these shows, it is the writer, the creator, the head writer, the emperor of the room, or what he calls the show runner. The amount of credit currently given to star James Gandolfini, for the success of the show The Sopranos, is entirely disproportionate to the amount of credit owed show runner David Chase; Jon Hamm’s acting ability, and his rugged good looks are a reason that people tuned into Mad Men, but the overall quality of the show is primarily due to the writing, and the obsession, of show runner Matthew Weiner; and Bryan Cranston isn’t Breaking Bad as much as Vince Gilligan is. Martin does give some credit to the stars, and to some of the individual writers of individual episodes, and to some of the other behind-the-scenes players of each show, but he maintains that these shows wouldn’t have been a fraction as good as they were, if they were in less capable hands than those listed as creator, or show runner. This isn’t to say that Martin’s book Difficult Men is as obsessed with credit dispersal as I am. He simply focuses his narrative on the history of these show runners, and the work each of them did throughout the life of the project in question. The rest of us can’t help but be obsessed with credit, especially when so many of our friends misdirect it to the stars. James Gandolfini is the face of The Sopranos, of course, and Jon Hamm is the face of Mad Men, so most of us can’t help but associate them with the shows, and subsequently give them all the credit. Just as we can’t help but believe Basic Instinct is Sharon Stone’s movie, and her coming out vehicle, and the movie where she showed a vital organ. Very few people have even heard of Joe Eszterhas and Paul Verhoeven. Everyone knows that Christopher Reeves was Superman, but how many people know the name Mario Puzo? How many people, on that note, know what Mario Puzo’s relationship to “Marlon Brando’s” The Godfather is? How many of those that love Entertainment Tonight, and their red carpet interviews, know anything about what happens behind the scenes of their favorite movies and TV shows, and how many would care if they did? Those of us that do care, and wish the creative types received more credit in the public arena than they do, have tried to stay in tune with the creative drivers of the projects we love, and we subsequently became obsessed with knowing which party deserves the credit for each production. Martin’s book Difficult Men informs us that we have been wrong in our credit dispersal when it comes to TV. Prior to reading this book, I assumed that in TV, like the movies, the directors rule. Those of us that love movies, for example, know that a Scorsese movie is almost always great, regardless of the star that leads it, the screenwriter that writes it (unless it’s Scorsese), or any of the behind the scenes players involved in it. Therefore, we obsessives have habitually searched through the credits of TV shows to see who the director was to determine if that show will be any good or not. Martin informs us, through a Matthew Weiner quote, that movie goers are dead wrong in their assumption that directors have the same amount of power in TV that they do in the movies. Those of us that love books, also lived with the somewhat sanctimonious assumption that individual writers were more of an essential ingredient to TV shows, but we didn’t put enough thought to the concentration of power that had to be assumed by the head writer, or “emperor” of the writing room, to keep it all consistent. Here’s what most of us thought. We knew that there had to be an “emperor” of the writing room, but we thought that an individual writer, of an individual episode, simply handed the finished draft to the head writer, and that head writer then either outright rejected it, or added a few notes here and there to spruce up the final product. We thought that the head writer acted in a manner similar to an editor of a freelance magazine, and he would continually reject an individual writer’s product, until it was perfect. We also knew each episode had a “writing room’s” influence on the finished product, but we had no idea—as in the case of Weiner and Mad Men—that the head writer, or the show runner, rewrote an average of eighty percent of every episode that was handed to him. We were the ones trying to dissuade our star-obsessed friends of the notion that the stars were the end all of a given product, and that it had more to do with the individual writers. Yet, we were even wrong by a matter of degrees. Martin writes that a show runner is, in general, and specific to these particular shows, the person that dreamed up the general premise of the show, wrote the show’s bible, and controlled and edited every aspect of that show. Martin’s description of the process is as follows: The writing team meets behind closed doors, they put in an ungodly amount of hours trying to come up with ideas for each individual episode. One writer will then eventually take the lead on an episode, and he and the rest of the writing team will eventually come up with a 40-50 page script. Once they have completed this script, the show runner will walk into the room, take the script to his office, and rewrite 80% of it, on average. For most shows, the next step in the process involves a debate between the studio execs, network censors, and the show runner over what they believe will be popular and acceptable to audiences and sponsors. With these three particular shows, however, the show runners state that this part of the process rarely involved much in the way of this intrusion. The one asterisk to the process described above, for these three particular shows, is Breaking Bad, as show runner Vince Gilligan regards the process as a more democratic one than Weiner, Chase, or even Deadwood’s creator David Milch do. It should also be mentioned, in this paragraph of asterisks, that Brett Martin’s Difficult Men covers a number of other shows in Difficult Men, including: The Wire, The Shield, Six Feet Under, and to a lesser degree Deadwood and Dexter. All of these shows, writes Martin, comprise what critics call the Third Golden Age, but I regard The Sopranos, Mad Men, and Breaking Bad as the triumvirate of it. Another little talked about aspect of these three shows, that turned out to be essential to the show’s long term success, was the main star’s willingness to acquiesce to the show runner’s ideas of where the character should go. Most stars are not willing to concede characteristics of “their character”, because it will reflect upon them more than the show runners. Most stars are not willing to put themselves in compromising positions, and they’re not brave enough to look bad on screen with the fear that it could affect the rest of their careers. Cranston, and to some degree Gandolfini, weren’t afraid to have themselves portrayed on screen in their underpants, which Vince Gilligan says is a “pretty good physicalization of their fearlessness.” These stars had to be willing to be very “un-starlike” for these particular shows to have the kind of flawed weaknesses that eventually made them monumental. As stated throughout Difficult Men, the egomaniacal nature of the show runners was paramount to the success of these shows. It dictated to the stars that they would acquiesce, but it also dictated to the networks that they would have to acquiesce too. Had any of these show runners sacrificed their egos, and gone with the “suggested” tweaks of the studio execs that eventually rejected these shows—just to finally get their project made—these shows surely would’ve been different, and possibly drained of most of the value they eventually brought to TV. One cannot entirely blame those studio execs that passed on these shows, as they had their own bosses to answer to, their sponsors to satisfy, and their audiences to avoid offending. To get these particular projects made, the studio runners needed a vulnerable network that was less concerned with controversy, and ratings, and in having “some say” in how the finished product would appear. “In TV, as nowhere else, the writer is king—none more so than those emperors of the air that control every aspect of an ambitious, ongoing cable drama,” Brett Martin writes in the GQ article. I’m embarrassed to say that I never heard of this term “show runner”, until I read this book, but I did have an idea that there had to be an “emperor” of the writing room. I had these ideas of how a show was created, but I never really focused in on it, until HBO informed me, in their ad campaign, that I should watch Deadwood, because its creator, David Milch, used to work on The Sopranos. AMC ran a similar campaign for Mad Men, saying its creator, Matthew Weiner, wrote for The Sopranos. Other than maybe Steven Bochco, I can’t remember a creator given such prominence in a show’s ad campaign, and Bochco largely created shows that I didn’t watch. I did watch The Sopranos, however, and I was willing to watch any show attached to it in anyway, especially when the ad campaign centered around the show’s artistic creativity and not the stars. The only reason AMC used the campaign they did, writes Martin, is that they couldn’t think of another way to market a show about ad men sitting around a table talking sales. As the title of this book suggests, the stories of these three shows involve difficult, uncompromising, and flawed males, but the real story, or the story behind the story that is not commonly talked about with these shows, involves the difficult, uncompromising, and flawed males behind the scenes that got these shows made, and finessed, until they achieved the creator’s idea of perfection. Portions of this book are devoted to the stars of the shows, but if you are purchasing this book to learn more about them, you’re probably also going to be disappointed, especially if your perspective is that they are strictly star-driven vehicles. And you’re probably going to be just as disappointed by the limited amount of space Martin devotes to Gandolfini’s psychosis, the Tweet page devoted to showing Jon Hamm crotch shots, and Bryan Cranston’s comfort level with being shot in his underwear in various episodes of Breaking Bad. That having been said, Martin’s book Difficult Men, and his perspective, is probably not what most readers would expect, nor—sadly—enjoy, but it’s fantastic. No reader, that makes it to the end of this book, could mistake it for a gossip piece that focuses on the daily lives of stars. It is about the creative process. It’s about quality TV. It is about how one show, The Sopranos, influenced some relatively vulnerable cable TV networks to pursue other, similarly “important” shows, until a Third Golden Age of television was born.